Lil' Bits "Heartstrings" is an essential elements pack when creating with this digital kit as it opens up so many more creative avenues. 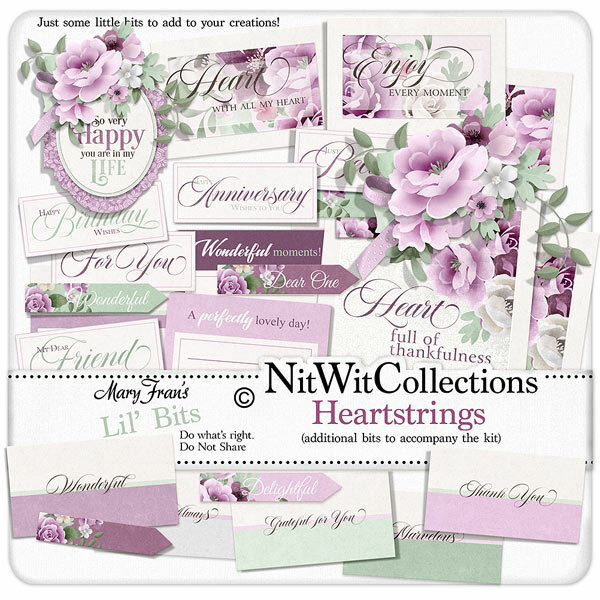 Don't miss out on these digital elements as they are not included in the FQB "Heartstrings" Collection so please don't miss out on owning and creating with these elements! 6 Arrow elements that you will be sure to want to use. The extravagant design will make your cards, scrapbook layouts and mini albums shine! 2 Journal labels....now which one to choose?? 1 Label in a floral frame style - "So Very Happy You Are In My Life"